Japan Subculture Research Center – Page 72 – A guide to the Japanese underworld, Japanese pop-culture, yakuza and everything dark under the sun. 極道語(Yakuza Terms). #1. What is a yakuza pineapple? It’s a hand grenade! Pretty poetic, don’t you think? 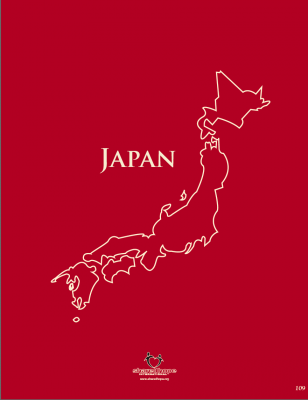 I heard the term last week when a cop was discussing a series of incidents in Fukuoka Prefecture in which the trucks of a landscape gardening company had grenades tossed inside them while the drivers were away, none of which exploded. Sometimes a pineapple is just a pineapple; sometimes, it’s a grenade. 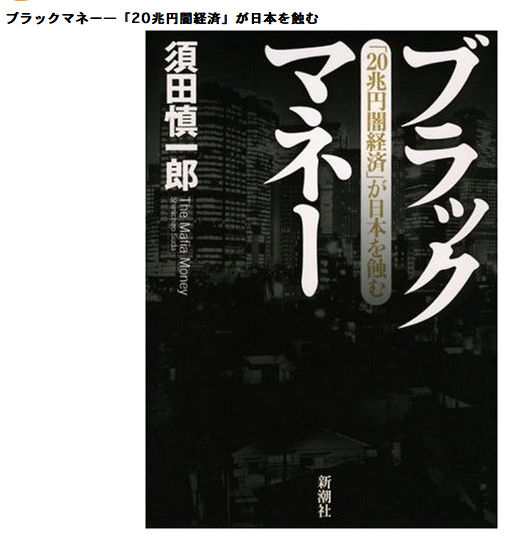 Posted on April 15, 2009 Author jakeadelsteinCategories Yakuza2 Comments on 極道語(Yakuza Terms). #1. What is a yakuza pineapple? This is an interesting article from The Independent about “the John Gotti” of Japan turning over a new leaf. Personally, I kind of wish I hadn’t made the remarks in the story at 5 am in the morning, but then again, they are kind of funny—in a black humor sort of way. Maybe Goto really does regret his depraved life and is seeking spiritual salvation. It would be nice if took some of his ill-gotten gains and donated them to charity to show his “sincerity” but I guess we’ll just have to wait and see. At the very end of the story is a photo of what allegedly is the statement that Goto passed out at his Buddhist priest initiation ceremony. I’m working on a rough translation although some of the words are fairly esoteric. Picture the scene: a fleet of black limousines crunches up the driveway of a Buddhist temple nestled in lush pine-carpeted mountains an hour west of Tokyo. The precious cargo of limousine one – a violent but ageing mob boss – steps out into the sun, surrounded by four sumo-sized bodyguards and is welcomed by a priest. As cherry blossom petals blow gently in the wind, the gangster enters the shrine and proceeds to be solemnly ordained into the Buddhist priesthood. It sounds like the opening of a terrible yakuza movie, but this is what took place in this picture-perfect setting when Tadamasa Goto, one of Japan’s most feared mob bosses, stepped out of the shadows this week and into the path of God. Unsurprisingly, he was watched – at a safe distance – by a 40-strong media scrum. It was as if the infamous mafia don John Gotti, a man with whom Goto is sometimes compared, had ditched his dapper suits for priests’ robes at the local Catholic church. 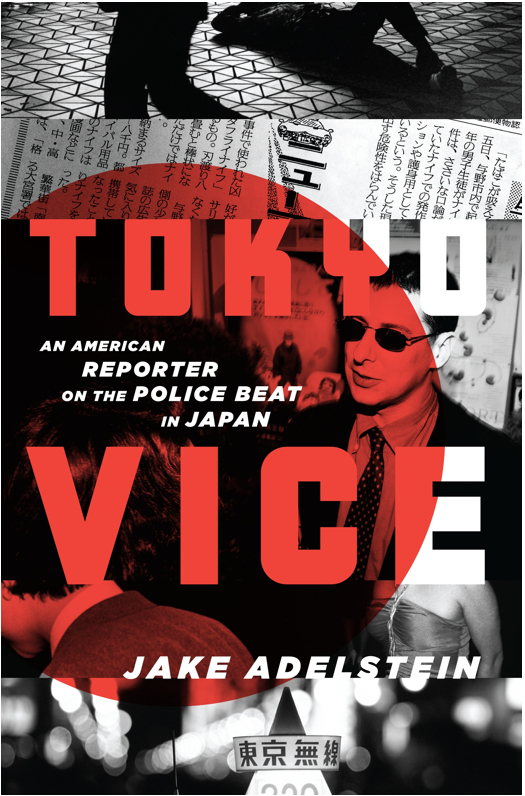 If you’ve come here because you have a “yen” to know more about Japan’s tattooed brotherhood, please check out TOKYO VICE: AN AMERICAN REPORTER ON THE POLICE BEAT IN JAPAN. Tokyo Vice is a look at Japan's underworld from the inside. It’s a more than a memoir and more than just about yakuza. It contains tales of dog breeding serial killers, the strange world of Japan’s red-light district, a look at human trafficking in Japan, the story of how four Japanese gangsters were able to get liver transplants at UCLA and why I think that’s a travesty, and an introduction to the rituals of Japanese daily life and especially those of a police beat reporter. And sometimes, it’s funny. Black humor, yes, but it’s there. It’s also everything I learned over the last fifteen years of wandering through the darker side of the land of the rising sun. There was a lesson to be learned there. Somewhere. Posted here is an interview I did with Ken Cukier at The Economist in February. 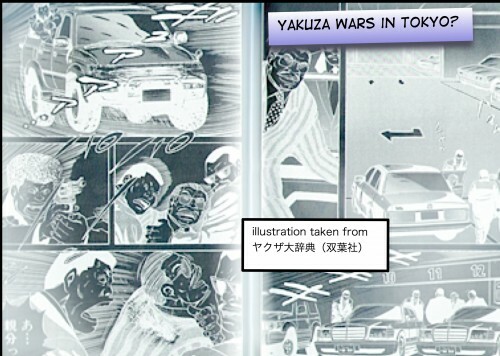 The article he wrote about why the yakuza are still flourishing was very insightful and certainly took an unusual angle in explaining the situation. If you know me, you may be surprised that I sound reasonably lucid in this interview. That’s those years of working in public radio finally coming in handy. If the link doesn’t work try clicking below. As Japan’s economy weakens, what are 80,000 gang members to do? TOKYO — Kazuhiro Yamada may describe himself as an innocent victim of the recession, but he is unlikely to win much sympathy. Until he lost his job last year, Yamada, who prefers not to reveal his real name, was a member of the Sumiyoshi-kai, one of Japan’s most notorious crime syndicates, or yakuza. As a mid-ranking mobster in greater Tokyo, his duties included shaking down businesses for protection money, chauffeuring his bosses around town and, on occasion, providing muscle when his gang’s relations with associates threatened to turn sour. Then, at short notice, he was unceremoniously dumped for not paying his dues, a non-negotiable condition of yakuza membership from the lowliest mobster to the men at the very apex of their criminal careers. “Without the organization behind me, what am I supposed to do? Who’s going to hire an old man covered in tattoos with a missing digit?” he says of his vanished pinkie, hacked off in a ritual act of penitence for a past misdeed he’d rather not discuss. An attractive residential backstreet, a highly desirable postcode and a hugely provocative bit of corporate relocation could unleash a murderous gang war on the streets of Tokyo. 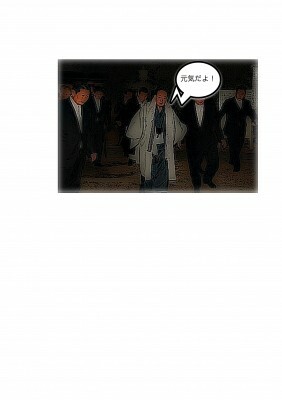 Takayama Wakagashira : The Defacto Leader of the Yamaguchi-gumi is alive and well….more or less. 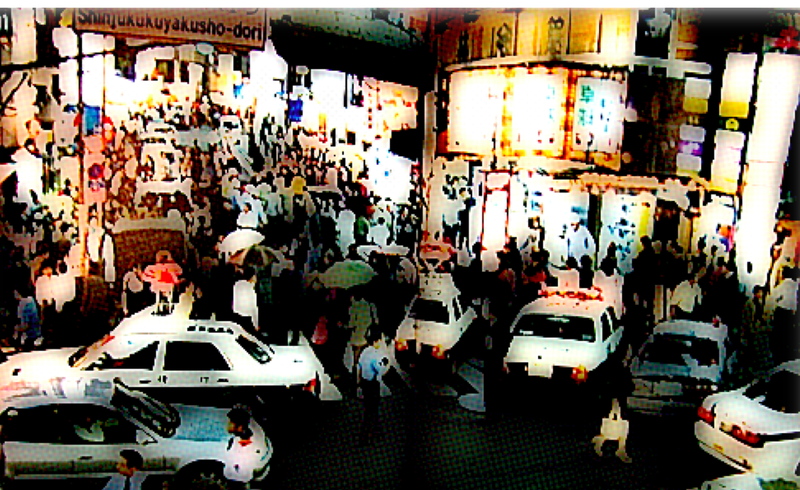 2009 should be an interesting year for us all and an especially interesting year in the world of organized crime. Around the close of the year, Takayama Kiyoshi （高山清司), the number two in the Yamaguchi-gumi, Japan’s largest organized crime group, collapsed at a “company function” and was briefly hospitalized in Kobe. The cause of his collapse was a heart-attack. Apparently, dealing with the failed coup by Goto and his minions and other issues creating conflict within the Yamaguchi-gumi have taken their toll on him. Rumors abounded that he was in critical condition or close to dying–but as you can see in these pictures, taken over the New Year–he is still very much alive. The ruler of the Yamaguchi-gumi, Tsukasa Shinobu, is also said to be in poor health, possibly suffering from prostate cancer. Medical care in Japanese prisons is terrible so you can’t help but feel a little sorry for him if it’s true. 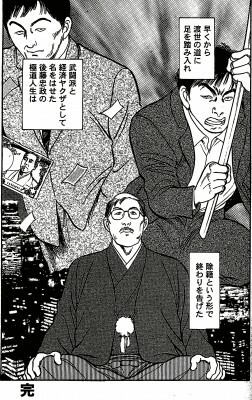 In any event, with the two defacto heads of the Yamaguchi-gumi in poor health–strife is sure to follow. The second photo is from the Yamaguchi-gumi’s annual rice cake making festival (餅つき大会）which is open to the public, and usually performed in front of their massive Kobe Headquarters. Who can dislike gangsters that make such delicious traditional Japanese treats? January 1st, 2009. 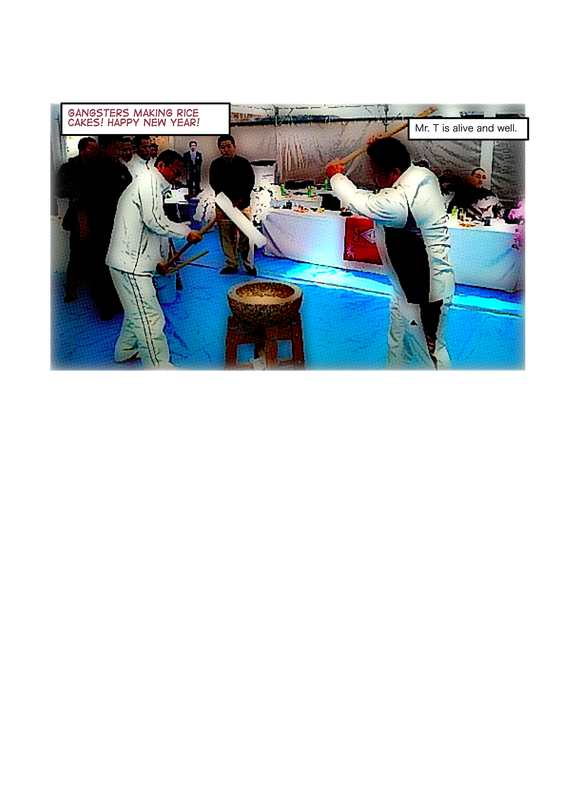 The Yamaguchi-gumi tries to maintain good relations with the local populace through events like this.